The Writing Bug: "All I Want is a Room Somewhere"
"All I Want is a Room Somewhere"
Having a space of your own where you can write, without interruptions, is essential. Okay, maybe it's just a fantasy. I teach college, and my office at work is often filled with students or co-workers. Sometimes I lock my door, turn off the lights, and try to write during my lunch hour. Inevitably someone hears the “tap, tap, tap” on my keyboard and knocks on the door. I do have a study at home; it has a desk, a futon, and four large bookcases. This is where I write most often. I feel lucky to have such a place. But I also have two Jack Russell terriers, Nikki and Lucy, who want my constant attention. Finally last year my husband Jim decided to build the garden shed he’d promised me since we moved into our house 15 years earlier. While my gardening skills are far from impressive, we maintain a few raised beds with flowers and a small vegetable garden. The finished shed is wonderful. 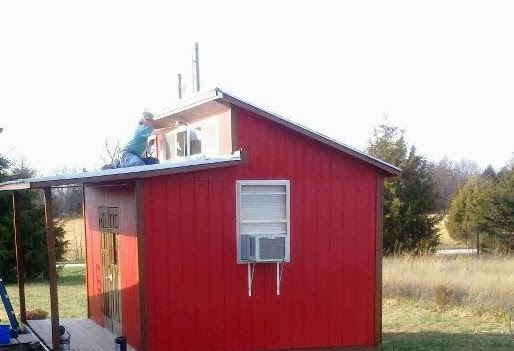 It measures 16 feet long and 12 feet wide and has a covered front porch. I was showing it off to my friend Casie, a writer of YA novels. She took one look at it and said, “writing room”. I looked at her as if she had just revealed to me the secret of the universe (which is actually “42” by the way, for Hitchhiker’s Guide to the Galaxy aficionados). It was an idea (the writing room thing, not “42”) that had never occurred to me. 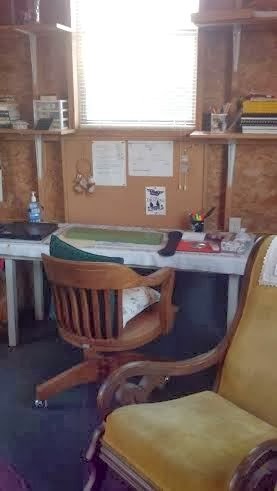 I realized then that the shed was more than adequate to store my garden supplies and still have a writing corner. Since it has electricity, I knew all would be well. Then it dawned on me that a portable heater in cold weather would work well but if I wanted to write there during summers it would need to be early morning work. So Jim installed a ceiling fan, and with the windows open, it was perfect. My garden shed is now a writing studio! Then one of my co-workers suggested a window air conditioner. So I dragged Jim to Home Depot and we found a great window unit that not only cools, but heats as well. Excellent! My "room somewhere" in my "Studio"
How cool is that? I like it! Shirley, welcome to the wonderful world of The Writing Bug. My room is a space in the furnished basement. I enjoy the seclusion, but I wish I could get some sunlight in once in awhile. I love your writing room, Shirley. I can see where running water would be a real bonus, but what you have now is pretty close to perfect. Even if you had left out the Hitchhiker's Guide to the Galaxy reference, this still would have been a very cool blog entry!